We got far off track on the other thread at times. This example from the SCOTUS will please not only the anti gun group, but me as well. What I like is that SCOTUS declined hearing the arguments and referred the cases back to local jurisdiction. What may work in Central Florida may not be a solution to an urban center so one rule is not the answer. .....Police Chief James Craig has repeatedly expressed his belief that legally armed citizens can deter crime because if more people were armed, criminals will think twice about breaking into their homes or attacking them. And the woman will live with the vision and the emotions of what she has done the rest of her life. Another unexpected consequence of gun ownership. I read a couple dozen of these every week and wonder how they handle it later. PTSD is not limited to veterans. I am certain that I would experience less trauma for having taken a life to protect an innocent over watching that same innocent assaulted or murdered while I remained powerless. I can't imagine that I'm all that unique in this. From experience, certainly you can justify the action, it still has a price you pay...often to yourself. And still I agree with you Melody. Your thought process always seems reasonable. Very true. This is why so many young people who have witnessed friends and family members being shot, shot at or killed are dealing with serious issues and a lack of mental health care. Who is caring for the 15 year old who saw his older brother get shot? There is a lot of anger, frustration, bitterness and hate being carried by young people who witness such things and there is a lack of resources being given to them. In Florida, the House has passed legislation expanding Stand Your Ground to include being able to use a weapon without firing it or to fire a warning shot, both as a deterrent if the holder of the weapon meets certain criteria. The Senate is expected to vote on a senate bill next week. On the other angle, Rep Hutchingson ® introduced a bill to repeal SYG which was defeated. "Rep. Reggie Fullwood, D-Jacksonville, pointed to black mothers who warn teenage sons, "Be careful because a black boy's life is not as valuable. "The law "may work for your community, but it's not working for ours," said Fullwood, who is African-American." A heated debate kept interest in the Capitol interesting. An associated common sense bill passing the House would protect school children from discipline for pointing a finger simulating a pistol or displaying a poptart which had been chewed to the shape of a gun. We have had a huge rash of expulsions and assignments to problem children schools because of extreme over reaction to insignificant events. Just today in the paper was the story of a high school teen arrested and expelled during a search of his truck in the school parking lot. A random search of the parking lot by a K9 officer recorded a hit on his truck. It was searched with no narcotics or para found. But in the tool kit, a "Leatherman Multitool" was confiscated because one of the attachments was a 2.75" knife blade (much like a Swiss army knife with pliers). ..... But in the tool kit, a "Leatherman Multitool" was confiscated because one of the attachments was a 2.75" knife blade (much like a Swiss army knife with pliers). The idiocy of these people is just off the chart. You'd be more likely to cut off you own finger if you tried to use a Leatherman as a weapon, your teeth are probably better suited as a weapon and probably more dangerous. Remember the funding portion reverted to the states after the 4th year. 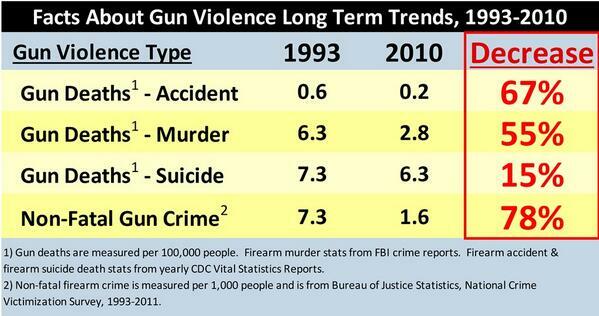 And realize that the AWB only affected less than 3% of weapon involved crime. SACRAMENTO -- The history of politics is littered with unorthodox and illegal schemes to raise campaign cash, but the method allegedly used by Sen. Leland Yee stands apart. A criminal complaint released Wednesday says the San Francisco Democrat wanted donations in return for connecting an Italian gangster from New Jersey with an international arms dealer. The gangster was an undercover federal agent. Although Yee is better known as a gun control advocate in the Capitol, the complaint says he talked tough about having shady contacts who could obtain automatic weapons. "Do I think we can make some money? I think we can make some money,” the senator said, according to the complaint. “Do I think we can get the goods? I think we can get the goods." “People want to get whatever they want to get. Do I care? No, I don’t care. People need certain things,” Yee allegedly said. The weapons, the complaint says, were going to be imported through the Port of Newark in New Jersey. Yee promised that his arms-dealer contact was the "real deal," but it's unclear whether Yee was actually capable of delivering on his alleged promises to procure weapons. The agent told Yee he wanted up to $2.5-million worth of weapons. After they arrived in Newark, some would be sent to North Africa or Siciliy, the agent said. Yee asked if he wanted automatic or semiautomatic guns, according to the complaint -- the same kind of weapons the senator has sought to restrict. While the criminal intent is most likely not common, the double standard of anti gunner politicians who would still maintain armed protection is rampant. April 19th. A date set asking gun owners to fire one shot at a certain time in a safe manner to show solidarity. Sorry folks, many of those attracted to the call will be firing across their yard, into the ground or up in the air. All of us are not responsible gun owners and such a call can be used as an excuse. Bad move. No, I'm not on Facebook, but this was on a national firearms forum. more idiocy, less common sense. Normal from that side. Is there any significance to April 19th as a date? This deserved its own thread. Pro-gun control lunatic who also happens to be a California State senator and author of some of the state's gun restriction laws, plays illicit gun-runner/smuggler in his spare time. Yeah. I'm not firing guns in the air for Hitler's birthday, Tim McVeigh or David Koresh. Also how weird is it that 4/20 is Adolph's birthday -- i'm looking at you legalization people. "In January Chicago started accepting concealed carry permit applications. Today the city posted the lowest Q1 homicide rate since 1958." Currently the Illinois State Police Firearms Services Bureau is experiencing a record number of Firearm Owner Identification (FOID) card applications each month. Accordingly, the Illinois State Police encourages applicants to allow ample time for production and delivery of their new/renewed cards. Please refer to the FOID INFORMATION PAGE for additional information regarding the application process. Another study concluding the showboating gun grabbers aren't really accomplishing anything but stirring up people to vote them out of office. If an armed populace is ultimately the only way that US urban residents can re-secure their neighborhoods, in the end that will be OK with me. It is probably true that in majority poor US central cities, the people on the inside cannot afford and no one on the outside is ever going to supply the $$ for the policing level needed to secure those neighborhoods - which does pretty much leave it up to the citizens. I think New York City is a better model of how to reduce crime, but it is an expensive one, but one that NYC can afford because of the huge private and commercial wealth inside the borough limits that is willing to pay for that solution. That model is just not relevant for a place like Detroit. But as we've all covered here before, limiting the lethality of available firearms is completely different set of arguments from urban crime and personal security and runs primarily to the issues of mass shootings vs the paranoias of the survivalist/urban apocalypse set. I don't have much sympathy to claims that any one 'needs' a high rate of fire high volume magazine weapon at their house, they are disasters waiting to happen - but I also don't pretend to argue that eliminating them will have any effect on aggregate everyday crime.